Can you dedicate your next work day to getting started with email marketing? If you can just clear your plate for one whole work day to focus on this, you can have your email marketing machine up and running, using my three simple steps. These steps may seem like a lot, and truthfully, they kind of are. But the trick is to keep moving through them, put aside perfection for just the day, and keep things as simple as possible. Nothing in business is ever 100% finished, and you can always go back and add. I find that the pressure to make something perfect the first time around is what holds most of us back. And email marketing is so important. In fact, there are two things that are the most important to me in growing my online business. Everything I do points back to these two things. My website and my email list are the only two online things that I full control and own. My social media accounts are actually owned by the social media platforms that they are on. I am there at their discretion. If I have my website and my email list, I can weather a lot of business storms! Without further ado, let’s jump in to these three basic steps. First, we need somewhere to collect all these email addresses we will be getting. In my marketing career, I’ve used almost a dozen different email marketing platforms. 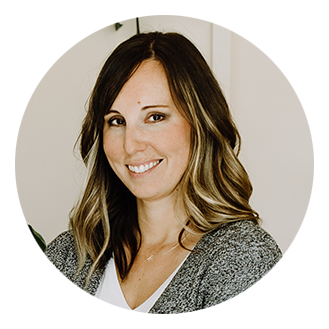 Some were during my corporate career, some I’ve used on behalf of clients that I’ve worked with over the years, and some are email platforms that I used in and for my own business, Molly Marshall Marketing. I’ve seen the good, the bad, and the downright ugly of email marketing platforms. I’m not going to go deep into how to select the best email marketing platform for you, that is the subject for a separate video, but I will just give a few basics to think about. Obviously, right? But it’s really important to think about how you are going to be using your email marketing for your business. Do you need to be able to create complex automations, like sales funnels that react to your subscriber’s actions? 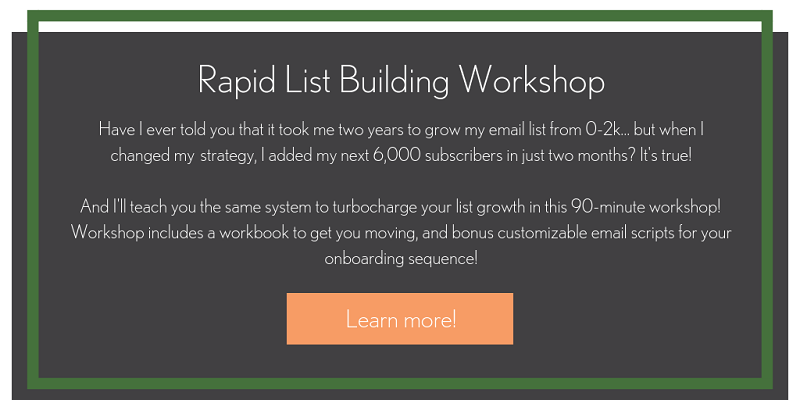 Or are you just going to be using email to touch base with your list once a month, like a newsletter? Do you have a separate software or tool for effective landing pages? Or do you need your email tool to also provide customized landing pages? I encourage you to just spend 15 minutes or so thinking about what you need – both now and in the future. You may have simple tech needs now, but also think about where you want to grow. Is it going to be a huge hassle for you to move to a different platform later? There isn’t a right or wrong answer, you just need to decide what is best for you. All of these features are going to influence the cost. On the low end, you have something like a Mailchimp that can even be used for free, with limitations, until you reach a certain subscriber threshold. On the high end, you have email marketing platforms that are part of large CRMs (customer relationship management tools), and can cost thousands of dollars per year. Again, you’ll need to balance your needs with what you are able and willing to pay. I have two email marketing platforms that I recommend and use. My very favorite, and the one that I use personally in my business, is ConvertKit. I mentioned earlier that I have used almost a dozen different email marketing platforms over the years, and ConvertKit is so versatile, robust, and affordable. I don’t want to badmouth past platforms that I have used, but the overarching reason was simple: they didn’t have robust, flexible automations that could grow and change with my business. While I might pay a little bit more each month with ConvertKit when compared to some similar products, I was able to also simplify and get rid of a couple of different tools I was using, like a separate landing page product. In the end, I feel like I am getting an incredible value for what I pay each month. The email service provider that I recommend for my smaller clients, local businesses, and email marketing newbies is Mailchimp. Mailchimp is very simple to use, is inexpensive or even free depending on how you use it, and it has enough features to satisfy most people, at least for a while. Next, after you have secured your email marketing platform, you need a great incentive for people to give you their email address. One option is to simply tell people you have an email list and ask them to sign up… but let’s be realistic. Most people are just going to ignore that! This is a lead magnet. For more specific help in creating an effective lead magnet that stands out above the noise, you should read: How to Create a Lead Magnet that Cuts through the Clutter. Lead Magnets are known by many other names like: freebies, opt-ins, free gifts, freemiums, and content upgrades. These are all the same thing. 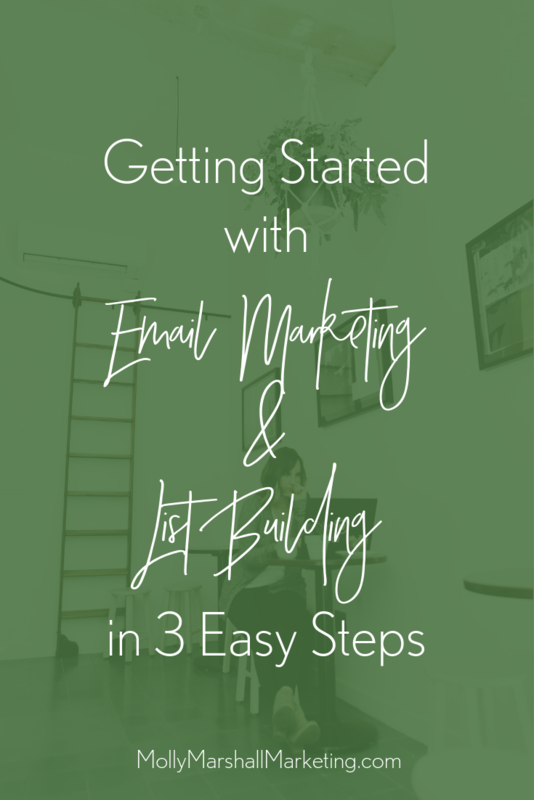 Since we are trying to get you set-up with email marketing in just one business day, we need to keep this simple for now, but here are a list of three characteristics for great lead magnets. A poor example would be a guide on how to drive traffic to their website. That is very helpful, important and somewhat related but this sort of lead magnet wouldn’t move them closer to purchasing your web design services. Great ideas for your first lead magnet are: short educational videos, checklists, PDF guides, a quiz, an email-based mini-course (like your 3 favorite tips dripped out over 3 days) or a free trial. It should be fairly quick and easy to consume. You do see larger lead magnets at times, like entire books being offered for free, but for now to get started the best lead magnet is one that can be both created and consumed relatively quickly. A great lead magnet meets a very specific need, and after your new subscriber has consumed it, there should be some kind of transformation or change. Like with my earlier example, the checklist of things to ask a potential web designer gives that person a concrete tool to use that helps them hire the right person. It makes their life easier by taking some of the guesswork out of a big decision. Now we have a lead magnet to offer in exchange for an email address, and we have a place to put the email addresses with your email marketing platform. Now we need an opt-in form that converts. Both ConvertKit and Mailchimp have simple forms that you can easily embed anywhere on your website. ConvertKit also gives you the ability to design nice, standalone opt-in pages, which I demo in the ConvertKit demo video above. Let me go back and talk a little about these. First, I recommend only asking for first name and email. The more you ask for, the less likely someone is to fill it out. You want to eliminate as many barriers as possible. Once you get someone on your list and properly onboard them, you can ask them to provide more information and preferences later. Later down the line you can also learn a lot about your subscribers by their behaviors. You can tag people that click on particular links and learn that Subscriber A always reads your Instagram articles, but never my Pinterest articles, etc. You can make your submit button more enticing by using active language on it. Instead of “submit” or “sign up,” say something like, “Send me my guide” or “Yes, I want in!” Changing up the language to be more engaging and active can improve your conversion rates. While your lead magnet is something that you will deliver digitally, it’s nice to include a thumbnail of the cover page, or maybe a screenshot of the video, or a tiny version of the checklist. It doesn’t need to be readable – after all, you want someone to request your lead magnet to get the content. But people like to have a little glimpse of what they are receiving. This is where you want to make sure that your lead magnet looks nice. It doesn’t have to be perfect, but consider hiring a designer on Upwork or fiverr, or adding a little flair to it yourself in Canva. Finally, if you have room on a landing page or a small opt-in box, add a few bullets that celebrate the benefits someone will gain from your lead magnet. 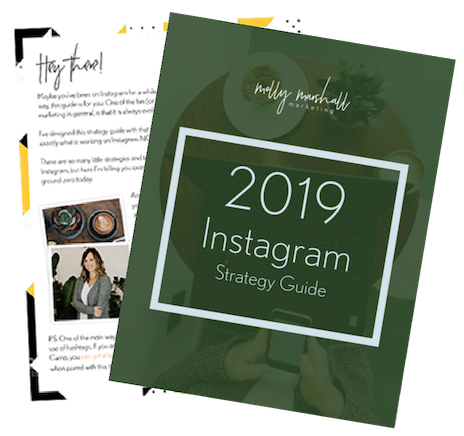 On my Instagram Strategy Guide landing page, I tell people that I’m sharing secrets to powerful storytelling that propel customers to buy, dozens of content ideas to keep your creative juices flowing, and tips on hashtags to ensure your posts reach more potential customers. Chances are, you already have an email marketing platform, so what you really need to do is put your head down on your lead magnet and opt-in page. Once these three pieces are in place, you are ready to start list building… which I will share in a future video. In the meantime, if you would like to learn more about properly onboarding your new subscribers, and how to grow your list large and fast, you can sign up for my on-demand Email Marketing Workshop at mollymarshallmarketing.com/email. Let me know below what your idea for your lead magnet is, and don’t forget to subscribe for future videos! I love everything you do Molly! Thank you for putting yourself out there and killing it!